These are Instant Dock Lifts that simply require positioning and plugging into a power receptacle and they are ready to go to work. They were designed for use with light equipment such as hand carts, 4 wheel carts and pallet jacks. All models are equipped with a hinged bridge equipped with a pull back chain. All models have a combination approach ramp, wheel chock. All of the electrical controllers are Underwriters Laboratories approved assemblies. Each unit is washed with phosphoric acid, fully primed and then finished with baked enamel. All cylinders are machine grade with clear plastic return lines. All pressure hoses are double wire braid with JIC fittings. These units conform to all applicable ANSI codes. These models were primarily designed to handle carts and dollies. 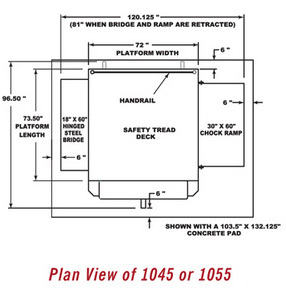 When the units are raised, the ramps become wheel chocks that prevent carts from rolling off of the platforms. The pull back chain on the hinged bridge allows the operator to pull the bridge back and secure it while the unit is being lowered, without stepping around the load. Wheel and dolly transport sets are standard on these units and allow the units to be moved on smooth concrete surfaces.